N.B. Students, however, do not need an account. 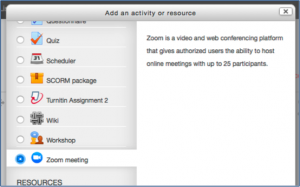 Once you have your Zoom account, go to the relevant course on Moodle and Turn editing on. 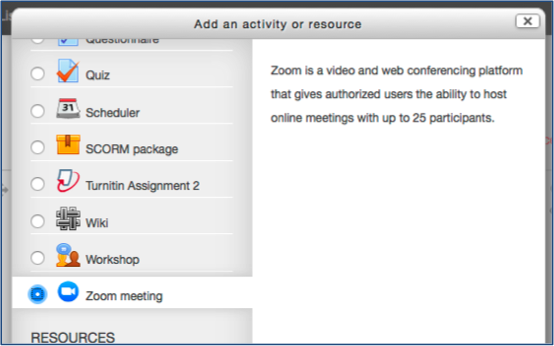 Click Add an activity or resource, select Zoom meeting and Add. Use When to set an opening time – make this earlier than the start of the meeting so students have time to join and familiarise themselves with the tool. They will need to download an app the first time they use it (see below). Use Duration to say how long the room should be open for – make sure it includes some time at the beginning and also allows for a flexible finish time if necessary. Use Recurring meeting if it is to happen on a regular basis. Set a password if you wish. Set the other options as required. The defaults are recommended until you become more familiar with Zoom. 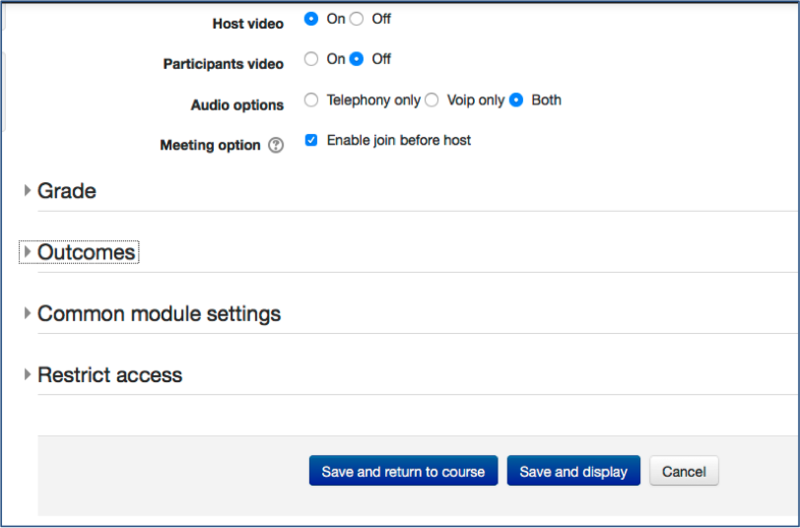 Host video On means video is active on your account when the meeting starts. Participants video Off means students will not have video by default. However, you can enable it during the meeting if appropriate. Audio options Both is recommended for maximum flexibility. 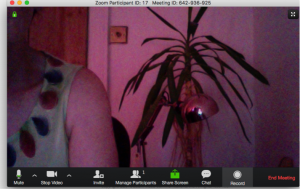 Meeting option Enable join before … is recommended so participants can overcome any technical difficulties and be ready for the meeting to start. Note that Grade and Outcomes can be used with this activity. On completion Save and Return to course. The link to the room will appear as below. 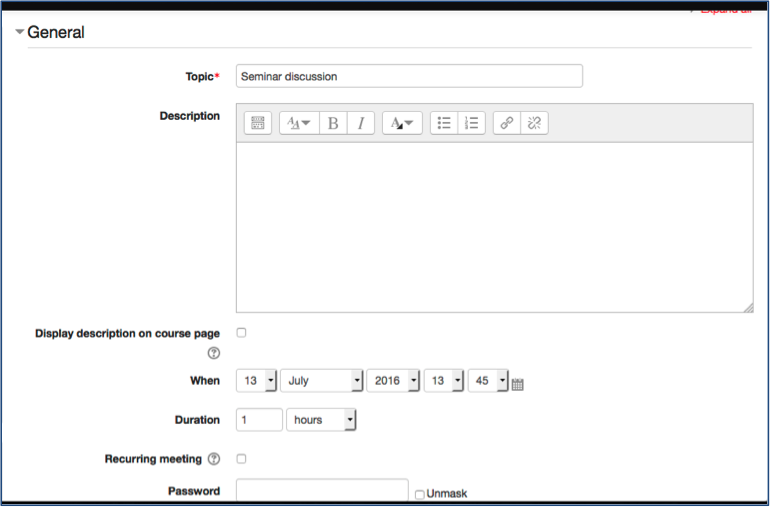 Click the link to review the settings and get an external link to circulate to any visiting speakers (and students as an additional option to Moodle). If you need to change any of the settings, use Edit settings from the Administration block on the left. N.B. Once students have access, they do not see all above options – they do not see the password details or the join link. 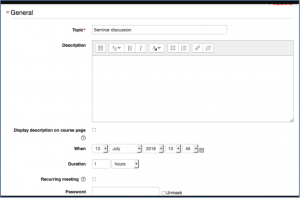 To start the meeting, click the Moodle link (or the join link– see above) and select Start meeting. If you are using Zoom for the first time, the Zoom desktop app will need to be installed. 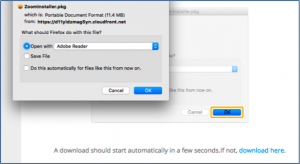 If the download does not start immediately, select Save file. 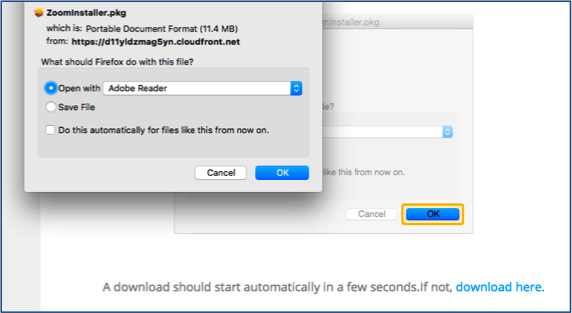 Then locate it in your download folder (if necessary) and double click to start the installation. Click Continue if you see the security message below. 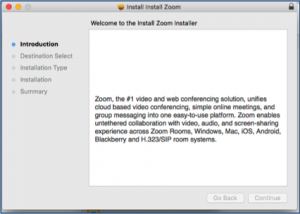 (The download and install sequence will depend on your operating system and security settings). Then wait for the installation to proceed. 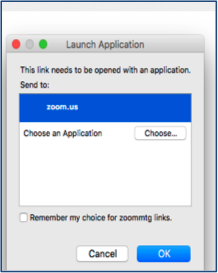 On the final Launch Application screen click OK to confirm acceptance of Zoom.us. (As well as desktop apps, there are apps for Apple and Android devices – check your app store for details). You will then be prompted to Join audio conference by computer amongst other options. 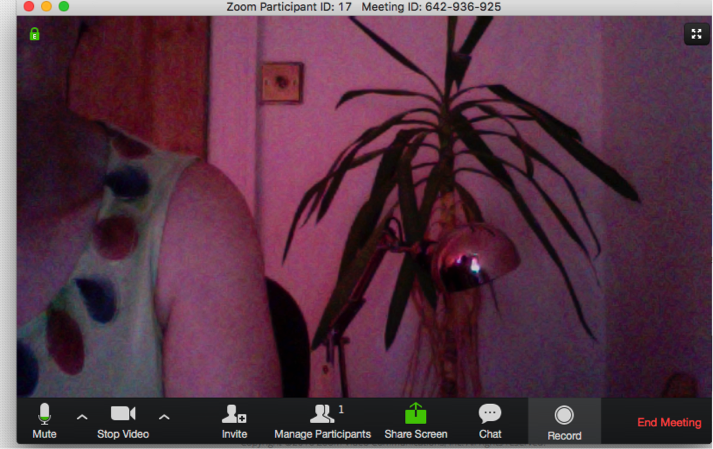 Click this and the conference room is then available and ready for participants. Use the settings at the bottom to manage the meeting. Click End Meeting to finish. If you, as the host, end a meeting before its scheduled finish, you are prompted as to whether you are leaving or ending the meeting for all and reminded of the need to appoint another host if the room is staying open. Click End Meeting for All if you are sure. 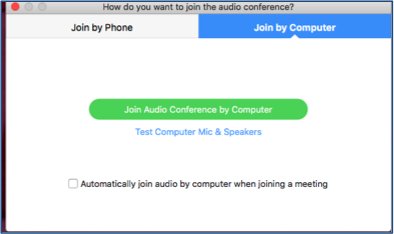 When you launch a meeting room (or when you launch the Zoom app), another window opens where you can check your schedule of meetings and join other meetings. 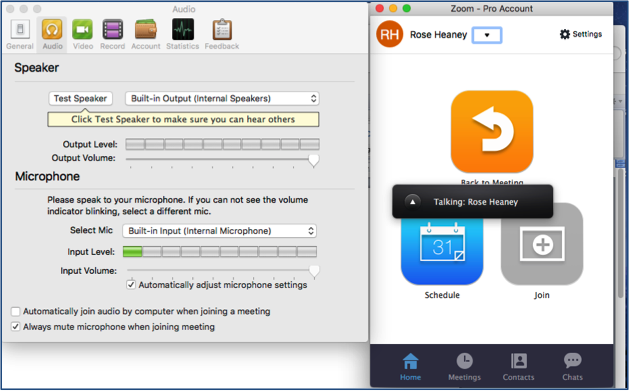 If you click Settings top right, you can manage technical aspects such as audio and video.